Andy Hamilton and Guy Jenkin are to return to their satirical roots with the five-part sitcom Ballot Monkeys. The series will be filmed one week before transmission and will draw on major themes and incidents of the current election campaign. As they did with their classic Channel 4 sitcom Drop the Dead Donkey, Andy and Guy will leave gaps during the editing process in which to insert highly topical material at the very last minute. The comedy will best set aboard the campaign buses of the four main parties - Conservative, Labour, Liberal Democrat and UKIP. Aboard each bus we follow the fortunes of a rich collection of characters; Press officers, line managers, empathy consultants, SPADs, IT wizards, social media monitors, political analysts, interns and even bus drivers – as they crisis manage the latest dramas and developments, the very same ones that viewers will be well aware of, having only recently read about them or seen the breaking news via social media. 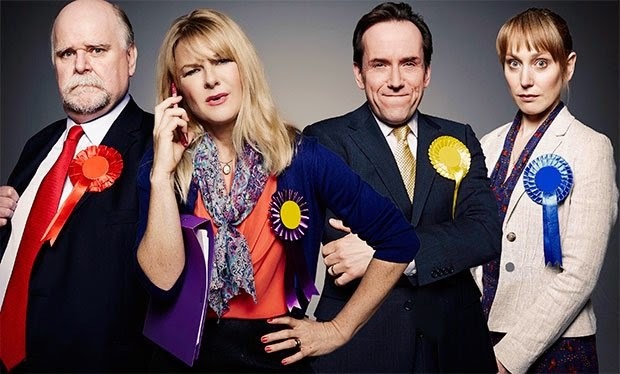 The series has an all-star cast including Ben Miller, Hugh Dennis, Sarah Hadland and Kathleen Rose Perkins.